In 1950 an isolated and unique herd of mustangs was discovered on the south slope of East Pryor Mountain overlooking the Bighorn Basin of Wyoming. 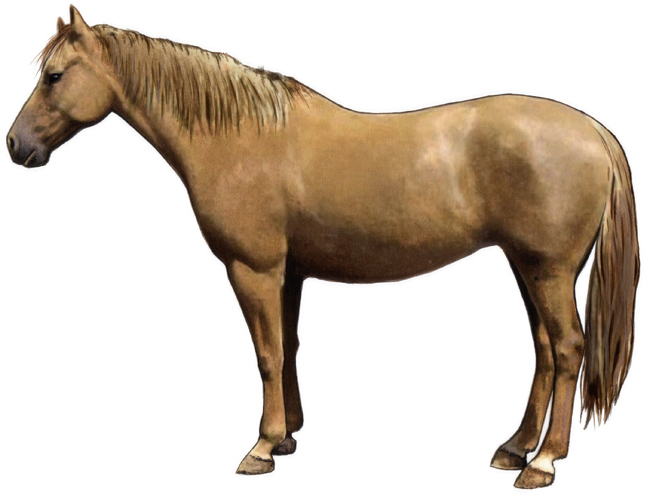 75 horses from the Pryor Mountain herd were blood-tested and found to be of Spanish origin, but natural selection and the mountain habitat caused natural evolution. The size remained small and compact, generally around 14 hands. The cold mountain climate led to a heavier body type, thicker necks and smaller ears. The Pryor Mountain mustangs come in a rich and brilliant array of colors and exhibit some of the most dramatic primitive markings seen on any breed of horse anywhere in the world. How these horses got to this remote area is a mystery. Some believe they were brought there by the Crow Indians who were highly-skilled horse traders; others have speculated that they are the descendants of horses that were stolen or escaped from the Lewis and Clark expedition. In September, 1968, Secretary of State Stewart Udall announced the creation of the Wild Horse Refuge in the Pryor mountains. Through the diligent efforts of the Lovell, Wyoming Pryor Mountain Wild Horse Association, and many other concerned citizens, this area was set aside to help preserve the unique breed of American mustang found here. The Pryor Mountain Mustang Breeders Association was started in 1992 to establish and preserve a gene pool for the precious resource these horses represent. By selective breeding the Colonial Spanish type has been emphasized in only a few generations. The Breeders Association plans to restore the best attributes of this breed and to demonstrate the versatility, endurance and intelligence of the Pryor Mountain Mustang.